During a time of tumult for administrative leadership on the University of Arkansas campus, Ray Thornton was named president of the University of Arkansas System. The Board of Trustees had offered the chancellorship to a new candidate after the brief tenure of B.A. Nugent, but the candidate abruptly rejected the chancellorship upon hearing that Thornton’s predecessor, James Martin, had resigned as president. Thornton was hired as president the same day, having served as president of Arkansas State University in Jonesboro the previous three years. Prior to ASU, he had served as a congressman from Arkansas’ 4th District and before that as Arkansas attorney general. He received his bachelor’s degree from Yale University in 1950 and a law degree from the University of Arkansas in 1956. During his presidency, Thornton orchestrated removal of the president’s office from the Fayetteville campus to a separate administrative office in Little Rock. 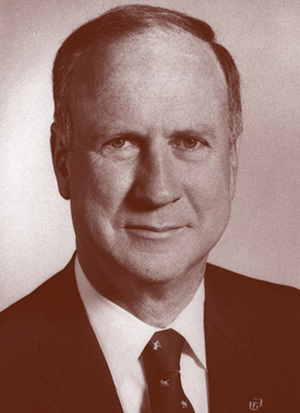 Thornton left the presidency in 1989 and returned to politics, serving three terms in Congress. In 1996, he was elected an associate justice on the Arkansas Supreme Court, before retiring in 2004. He most recently served as a fellow at the William Bowen School of Law at the University of Arkansas at Little Rock. Personal: Thornton was born July 16, 1928, at Conway, Ark., to R.H. and Wilma Stephens Thornton. He married Betty Jo Mann, and they had three children.